"God blesses those who are poor and realize their need for him, for the Kingdom of Heaven is theirs. God blesses those who mourn, for they will be comforted. God blesses those who are humble, for they will inherit the whole earth. God blesses those who hunger and thirst for justice, for they will be satisfied. God blesses those who are merciful, for they will be shown mercy. God blesses those whose hearts are pure, for they will see God. God blesses those who work for peace, for they will be called the children of God. God blesses those who are persecuted for doing right, for the Kingdom of Heaven is theirs." [Matthew 5:3-10]. Where to Apply: PhilamAsia Labor Pool, Inc. Position: ENGINEERS, CERTIFIED RIGGERS, SPA MANAGERS, RESTAURANT MANAGERS, etc. You have worked hard. Give yourself a gift: Watch for Men. Positions: Male Secretary, Aircon Technician etc. (|) Cutter Meat for Canada - by GOLDEN Horizon Placement Agency, Inc. Put your business online! There is one site which provides all your basic needs to have an online business. “www.iCheckDomainS.com – Your Portal on Buy and Sell Domain Name Busines". Create your account now FREE and select the services you need at reasonable prices. 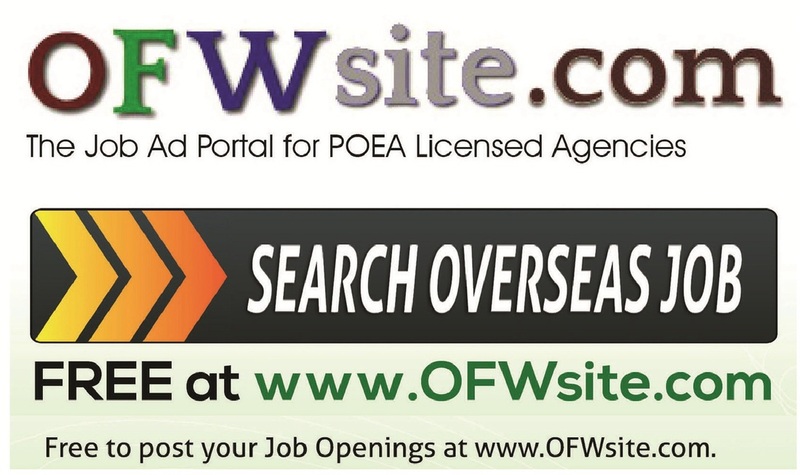 "The JOb Ad Portal for Licensed Agencies"
We are here to serve as information portal for all Philippine Recruitment Agencies duly licensed by the Philippine Overseas Employment Administration (P.O.E.A. ), and for Filipino workers who may need a venue to find helpful information for their job inquiries. 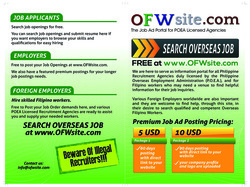 Various Foreign Employers worldwide are also important and they are welcome to find help, through this site, in their desire to search qualified and competent Overseas Filipino Workers. Verify Status of License of Agencies. We have featured Premium Job Postings for your longer job advertisements. You can search job openings, and submit resume here if you want employers to browse your skills and qualifications for easy hiring. Hire skilled Filipino workers. Free to Post your Job Order demands here. Get ready to receive your needed workers. Search your favorite gig seller. Do you have a Facebook Fanpage or twitter page? Convert it with your own Personalize website address. Roger Alim Rodriguez urges the Philippine government to "FUND AND EXPLORE DEVELOPING SOLAR ENERGY PROJECT TO RURAL BARANGAYS". You may also want to get your own company's e-mail address under your own branded name, Example: info@yourname.com, and your own website (www.youragency.com). Disclaimer: With the use of this site, all parties are advised to always exercise due care. Please verify with the POEA Licensed Agencies concerned on the availability of the jobs posted here, and to verify with the POEA on the validity of their license and existence of their job orders. Thank you. "All Rights Reserved. Copyright 2012-2018. ofwsite.com"